“Probe is the most provocative game of words since the invention of the modern alphabet”. Originally released in 1964 by Parker Brothers, Probe is a Hangman-style word game fun for the whole family. It includes four decks of 96 uniquely coloured letter-cards, four letter-card holders, four letter-card trays, and a 48-card activity deck. Each player thinks of a word to use in the game. If the word is fewer than 12 letters, a dot is put into the beginning or end of the letter tray to fool the opponents about the true length of the word. Gameplay starts when the selected player draws an activity card. Prompts include “add 20 to your score”, “take an additional turn”, “deduct 10 from your score”, and so on. The same player begins to guess a letter within any opponent’s word. If the guess is successful, the opponent reveals the letter on their tray and points are awarded (5, 10, or 15). The player continues their turn. If a guess is unfruitful, the play advances to the next player. Extra points are awarded for guessing an opponent’s final hidden card. 100 points are deducted if a player has spelled their own word incorrectly! The game ends when a full word (including any dots) is revealed. The player with the highest point score wins. Created for two to four players, the games can be combined to accommodate larger groups. 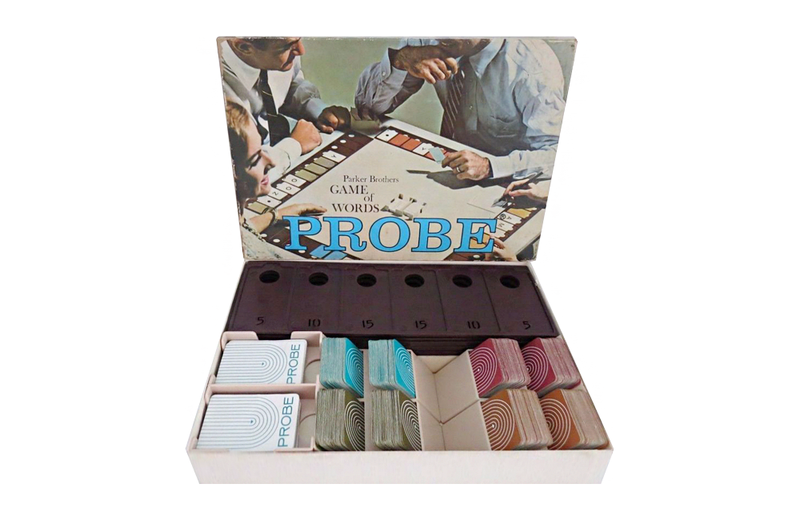 Parker Brothers printed Probe from 1964 to 1982. Sets are readily found in thrift shops and on eBay for an accessible price. Explore classic toys and games that captured our attention and never leand never let go.